When describing orthodontics, most people just refer to braces. While the majority of orthodontic cases involve braces, there are alternatives that may be used for younger children or adults. Arch expanders for younger children can minimize or eliminate the need for braces when the problem is treated early enough. Invisible, clear plastic retainers, instead of braces, can be used by adults for mild to moderate crowding problems. What is an Orthodontic Evaluation? 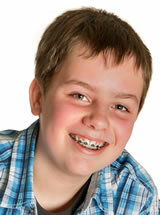 Orthodontic treatment with braces begins with an evaluation appointment.Dr. Fattahiwill first visually determine if you are a good candidate for orthodontic treatment, or if another treatment would be more appropriate. If you are a good candidate for orthodontic treatment,Dr. Fattahiwill take impressions of your teeth, special x-rays of your jaw joint, head and teeth, and very important measurements of your teeth and mouth. If your child develops an "open bite", or you are otherwise concerned about the development of your child's teeth, no matter what the age, contact us right away for a consultation withDr. Fattahi. Otherwise, children should be evaluated by the age of 6 for orthodontic treatment. In the past, a child was 11 or 12 before brackets were actually placed on the teeth to straighten them. This may still hold true in most cases, but there are new techniques that can correct problems early, while a child is still growing. This may eliminate the need for braces in the future, or if the child does still need braces, the treatment will be less complicated, usually shortening the period of time in braces. Are Braces Only for Kids? Adults are finding that having braces isn't kid stuff anymore. Many adults are turning to braces to correct problems with their bite. They recognize the benefits of reduced wear, reduced incidence of TMJ problems, and increased self-esteem. Major adjustments must be done with braces, but some adjustments can actually be done without braces! She's wearing "invisible braces" in one of these two photos. Can you tell which one? It's difficult to tell, isn't it? That's the whole point! Please Contact Us if you would like more information sent to you.